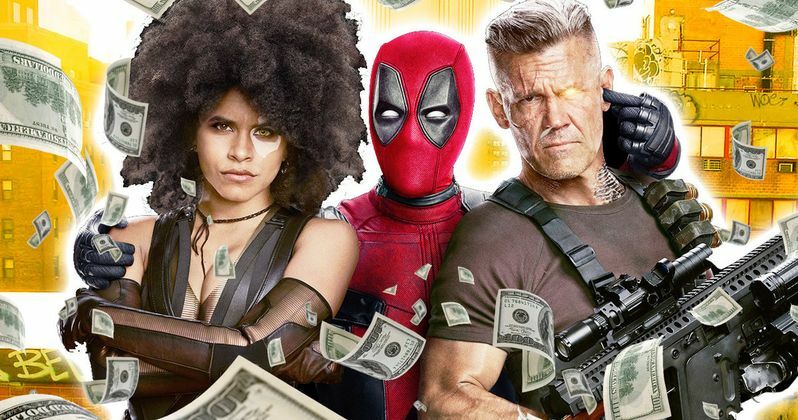 Heading into the weekend, there was practically no question that Deadpool 2 would end up atop the box office, going up against Book Club and Show Dogs, but the big question was could the sequel top the box office record for highest opening weekend for an R-rated movie, $132.4 million, set by the first Deadpool. As it turned out, the sequel couldn't quite top its predecessor, with the box office weekend estimates revealing Deadpool 2 has taken in an estimated $125 million. While some box office projections were as high as $150 million for the opening weekend, the superhero sequel fell just a bit short. Deadpool 2 had a decided advantage over the original Deadpool in a number of ways, but it still couldn't top its opening weekend record. Deadpool 2 opened in a whopping 4,349 theaters, tying Marvel's The Avengers for the 11th widest release of all time. It was also a big 791-theater increase from the 3,558-theater rollout of Deadpool, with the studio also giving it a plum mid-May summer release, instead of the mid-February release of its predecessor. While Book Club did fare a bit better than expected, it didn't really have any impact on the Merc With the Mouth's box office performance. Deadpool 2, which also has the same Rotten Tomatoes score as its predecessor (83%), earned a $28,742 per-screen average, an impressive tally for sure, but one that still falls short of the original Deadpool, which earned a $37,222 per-screen average in February 2016. Deadpool 2 also earned an additional $176.3 million in its international debut for a worldwide opening weekend tally of $301.3 million. The worldwide figure is nearly triple the reported $110 million budget, which was nearly double the $58 million budget of the first Deadpool. The movie has opened in almost all of its international markets, with the movie debuting in Vitenam May 25, Hong Kong on May 31, Mexico on June 1 and Japan in an unspecified date in June, with no Chinese release planned at this time. Deadpool 2 finally took down Avengers: Infinity War, which easily ran roughshod over the box office competition for the past three weeks, as the movie slipped to second place in its fourth frame with $28.6 million, bringing its domestic total to $595 million with a worldwide tally of $1.813 billion. It seems incredibly likely that Avengers: Infinity War will be just the fourth movie in history to pass $2 billion worldwide, joining Star Wars: The Force Awakens ($2.068 billion), Titanic ($2.187 billion) and Avatar ($2.788 billion). Debuting in third place is Book Club, earning a decent $12.5 million, with a $4,495 per-screen average, with the top 5 rounded out by Life of the Party in fourth with $7.7 million and Breaking In in fifth with $6.4 million. The top 10 is rounded out by Show Dogs ($6 million), Overboard ($4.7 million), A Quiet Place ($4 million), Rampage ($1.5 million) and RBG ($1.2 million). This also marks the first time that Black Panther has not managed to crack the top 10 in its 14-week run at the box office. If it would have done so, it would have been the first movie since Avatar to achieve such a streak. Looking forward to next weekend, Disney and Lucasfilm roll out Solo: A Star Wars Story, the only new movie in wide release over the Memorial Day holiday weekend. Take a look at the top 10 estimates below, courtesy of Box Office Mojo, and check back Tuesday for next week's predictions.